You didn’t think I’d leave you with only one amazing option this fall, did you? I know we are still overly obsessed (in the very best way) with our homemade pumpkin spice latte and rightfully so. A homemade pumpkin spice latte is clearly the drink that’s meant to be enjoyed multiple times (maybe even daily?) as the leaves begin to change (which I know nothing about…Florida gal) and sweaters are worn. I’m not asking you to abandon the pumpkin today, rather maybe add some variety? Think of this as a delicious change to keep things from getting boring (side note: homemade pumpkin spice latte would never make it to the boring list). 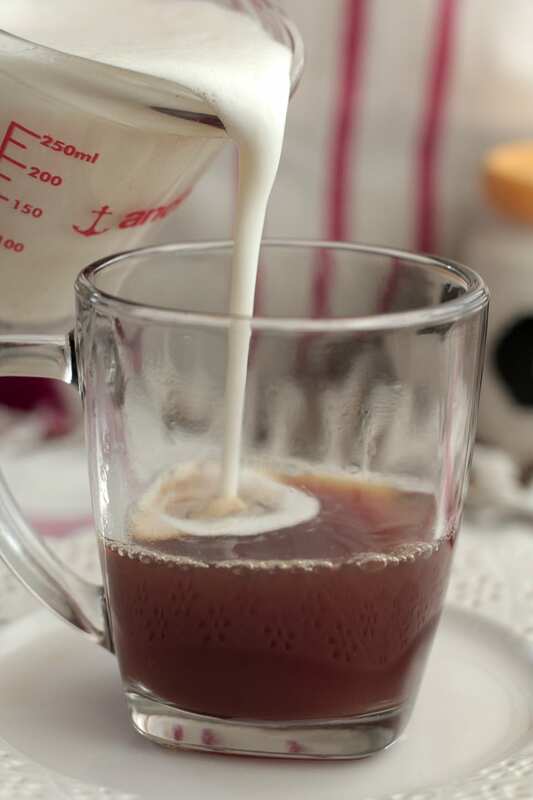 Trust me, friend, I know you’re going to love filling your favorite mug with warm chai spices, organic black tea, and perfectly frothy raw milk. See, delicious change and welcomed variety! Nothing to worry about. Today, while the tea is warm and the milk is frothy, let’s just sip, savoring the new season upon us. There are seasons in life when chatter abounds and other seasons when the cool mornings and warm mugs filled with homemade treats are meant for quiet enjoyment in the good company of trusted friends. Pull up a chair, let’s sip away! You’re going to love the refreshing change (we can get back to the pumpkin tomorrow) this homemade chai tea latte brings to this season of life. Pull up a chair, let’s sip away! You’re going to love the refreshing change this homemade chai tea latte brings to this season of life. For the chai tea: In a medium-sized saucepan, bring the water and spices to a boil. Whisk the spices in the water. Once the water reaches a boil, turn off the heat and allow the spices to steep in the water for 5 minutes. After 5 minutes, turn the heat back on and add the black tea bag and maple syrup. Return to a slight boil (the goal is a hot liquid for steeping). Once boiling, turn off the heat. Allow the tea bags to steep in the water and spices for 5 minutes. Remove the tea bags and strain the tea through a fine mesh strainer. Reserve 1/2 cup of chai tea for the latte. 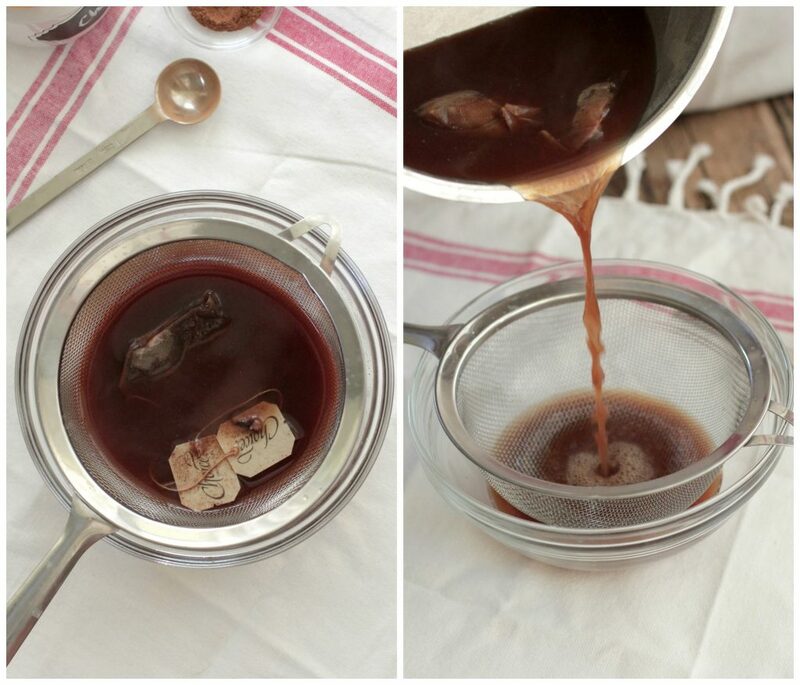 Store the rest of the chai tea in the fridge up to two weeks for freshness. 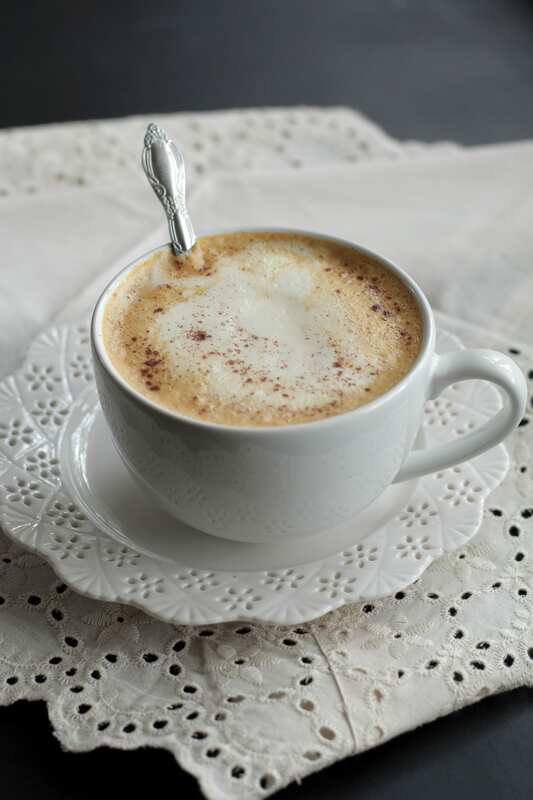 For the latte: In a medium-size saucepan, bring the milk, maple syrup, and pinch of cinnamon to a slight boil (the sides of the milk will begin to bubble), stirring often. Once the sides of the milk begin to bubble, remove the pan from heat. 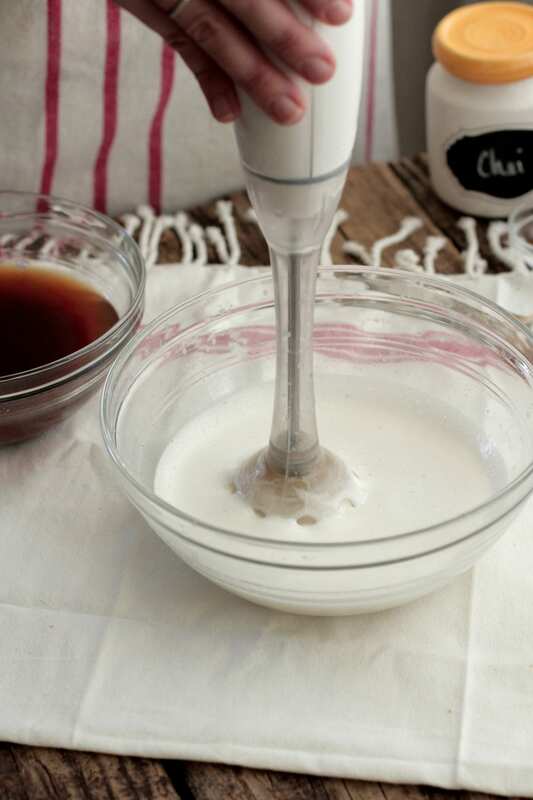 Using an immersion blender (this is the trick to a frothy homemade latte), blend the milk until it's frothy. Pour 1/2 cup of chai tea in a mug. Slowly add the warm, frothy milk to the tea. Sprinkle the top of the chai latte with an extra pinch of cinnamon, if desired. 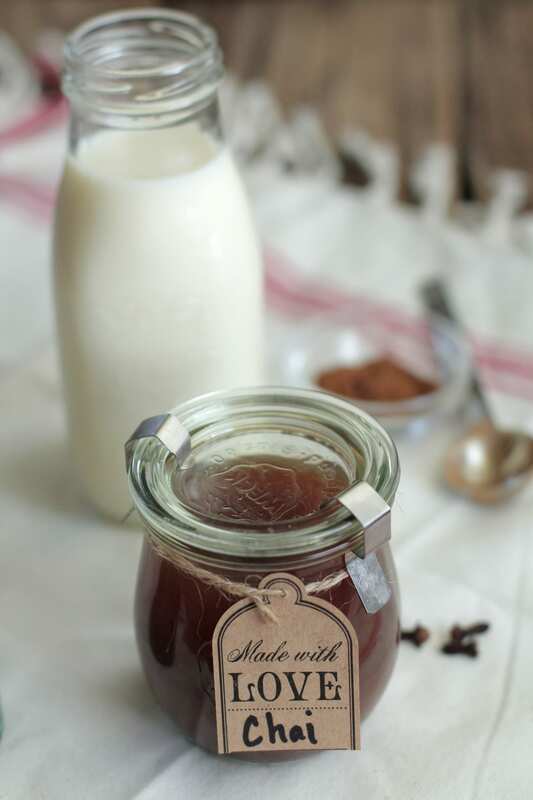 Shake and strain the extra chai tea after refrigeration as some leftover spices can settle at the bottom of the jar. To make this recipe dairy-free, use canned coconut milk (shake first before opening) instead of whole milk. Pumpkin Chai Latte Version: You can make a pumpkin chai latte by whisking 2-3 tablespoons of pumpkin puree into the milk as it warms. This is awesome! My mom’s favorite Starbucks drink and now we can make it at home! Awesome, Medha! She’ll love the homemade version!! I make my chai latte by putting the tea bag in a mug of milk (I use soy) and then I heat it in the microwave for about 90 seconds. When the milk is hot and the tea is brewed I add some sugar and some honey. That’s a fantastic recipe, but you shouldn’t call it chai latte. I’m glad you enjoyed my Chai Latte, Delly. Lol. What a perfect plan!! And since there’s raw milk in these lattes I’m sure they are technically a health food ;). Just pinned this. It looks amazing and I can’t wait to try this with coconut milk. I love all these warm fall-inspired beverages you’ve been sharing! I’ll definitely be sharing this via social media! Thank you so much, Kelly. Even with the super warm Florida weather I’ve been in the mood for warm fall drinks :). Enjoy!! Hey Meagan, I’m so glad you loved the chai latte!! You’re so welcome :). This looks so good. FYI, friends of mine from India told me once that Chai means tea. So, Chai Tea is like saying Tea Tea. Thank you, Ginger. You are absolutely correct. Chai means “tea”, but since so many in the U.S. know this drink as “chai tea” (thanks, Starbucks ;)), I decided to include “tea” in the title. I had the most wonderful chai tea latte on a recent trip to Colorado. Since then, I’ve been trying to recreate the flavor and texture at home, but with little success. That is, until I found your recipe! Thank you for sharing. I love the recipe and the photos are beautiful! So delicious! Not very spicy put you can always adjust the spice levels. I’m so glad you like it, Veronica :)! I wonder how long I can keep this in the fridge until it goes bad? Hey Sofie, The chai concentrate will last a couple of weeks in the refrigerator. Love the recipe for the chai latte, Kristin. Can’t wait to try it! 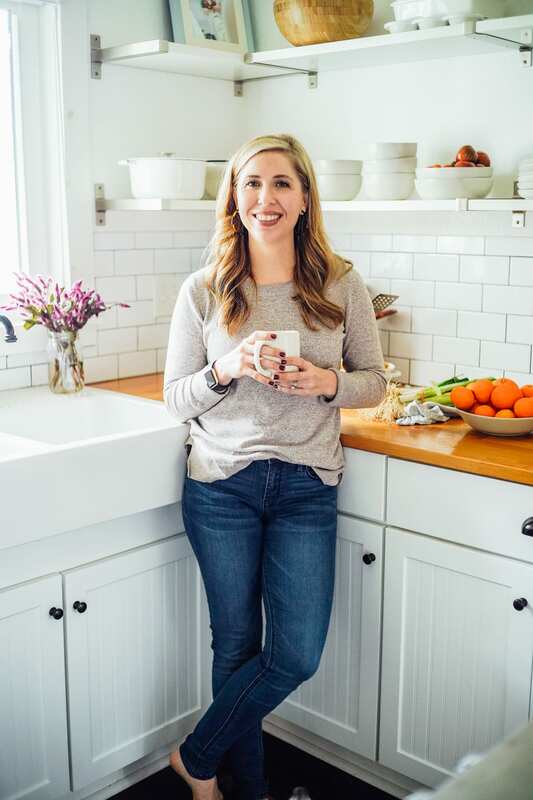 Hey Anna, Thank you so much for your incredible endorsement of this latte recipe! I’m so glad you like it. Can I sub 2 percent for the whole milk, Kristin? Hi Celestial, Yes, you can. Thanks so much for this recipe. 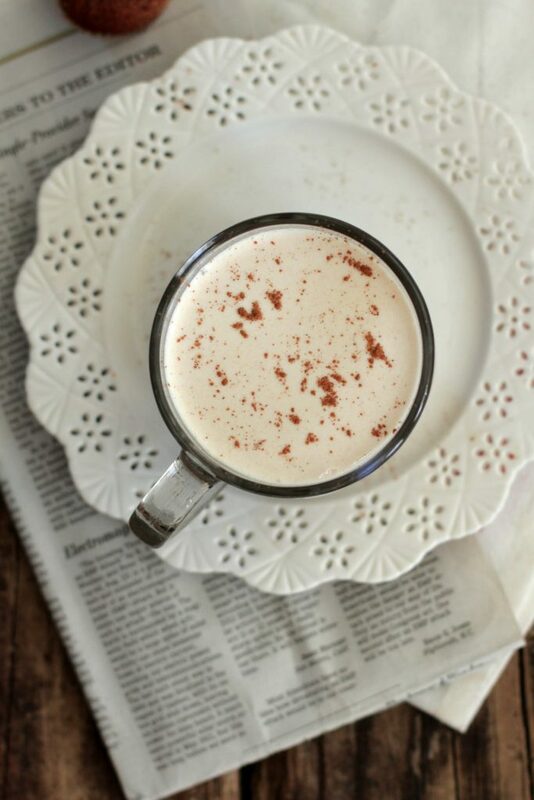 I’ve tried many other chai latte recipes, authentic and not, and this is hands down, the best! Absolutely love it. Love the fact that it makes extra so you can keep the tea in the fridge and just add the milk etc on the stove as needed. Grabbed the zucchini muffin recipe while I was at it…looks fab. Now a subscriber 🙂 You rock! Can I substitute pure maple syrup with any sugar? Hey Frankie, Yes, you can :). The latte will be sweeter, so you may need to decrease the sugar a bit. Hi there! Love a good chai tea latte. Do you have suggestions on how to make this recipe iced? Hey Liza, You can add cold milk to the chai concentrate (after it’s been chilled). Enjoy!! Hi There! Would herb tea work instead of black tea? Hey Deneen, I believe so :). Enjoy!! Vanilla rooibos taste great with this recipe, Deneen. Okay, I’ve made this twice, and twice I’ve gotten this gelatinous goop that is really hard to strain. Am I supposed to get that? Am I supposed to strain that out? Or is that part of the chai tea? Or am I doing something completely wrong? Hey Debra, Gelatinous goop doesn’t sound right. Is the gloop coming from the tea or the milk? If it’s the milk, the problem may be due to boiling. This issue can be solved by warming the milk and turning off the heat before it reaches a boiling point. If it’s the tea, I’m not sure what would be causing the gloop. I got the gelatinous goop too but it was from the seasonings mixed with the water after boiling. I got that gloop as well, I just tossed it after straining. I think it’s the maple syrup. I noticed it after I put the syrup in the pot, and it stayed that way for straining. The beverage was amazing though! One coming right up for breakfast! The gloop made this inedible. Off to find a better recipe. Sorry to hear that, Dona. I’m surprised to hear that a gloop made the entire drink inedible. A recipe that uses whole spices, or just using a chai tea bag and combining it with steamed milk, may be what you’re looking for. Hi! This recipe sounds so good and I can’t wait to try! How much does this recipe make? Hey Morgan, The concentrate will make enough for 2 drinks. The milk (“latte” part in the recipe) will make enough for one drink. Would it be possible to substitute the cardamom? I can’t seem to find any at my local stores. Hey Lucy, The cardamom really creates the classic Chai Latte flavor in this drink, so it can’t be substituted. It’s a great baking spice, too, so ordering online might be a possibility. You can get all the ingredients at Mountain Rose Herbs. They even make a chai tea mix, already mixed with the spices….AND a caffein free version called firefly chai. They are a GREAT company. I live in Eugene, where they call home, don’t work for them or have any affiliation, but go there almost weekly for my weekly order! Great people, friendly and so helpful! That’s awesome, Carol. Thank you for sharing. I love MRH! 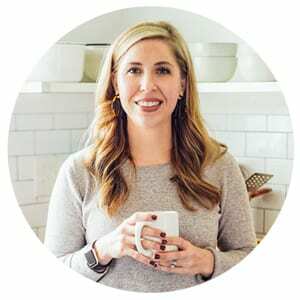 I’m hoping to use this recipe for a holiday food swap – if they do not wish to make it a latte, and just have a warm or hot chai tea, what part concentrate and what part water/milk to you mix? Or do you just heat up the ingredients for the “chai tea” by itself? Thanks! Hey Erica, You’ll need make a large portion of the chai recipe and the milk recipe, keeping them separate. The ingredients for the chai will be heated up separately. Have fun! Thank you for the recipe!! I’ve just made my first batch of concentrate, however, it didn’t turn out quite as spicy as i would like it to be (there seems to be just a tiny trace of spiciness). I am not very sure if it’s due to my spices or it was meant to be this way? Also, if i would like to increase the spiciness, which spices should i add more of? Hey Rachel, This will really depend on your personal taste. I would probably increase the cinnamon and cardamom, then taste-test and add any additional spices. Thank you for the delicious recipe. I love it! Wonderful, Lise! I’m so glad you’re enjoying the chai latte! Oh so yummy! And not full of yucky bad for me stuff! Thank you for sharing! I’m so glad you like the latte, Trisha! Home with a cold and decided to give this a try…so delish, comforting and adding a cinnamon stick to my cup made me feel much better! To adjust the spiciness to my taste, I just added a bit more chai to the milk. Thanks for a great recipe! Hey Kathleen, I’m so glad this drink was such a comfort! Feel better soon! I was just wondering, and I’m clearly the only one. In the recipe you state 2 whole cloves. 2 whole cloves of what? Hey Michelle, Whole cloves like this: http://amzn.to/1SCTo6I :). Cloves, the spice, come in two forms: ground and whole. I use a one cup size French press for foaming the hot milk. I also sub out some of the milk for hot water, still delish! This sounds so simple, I can’t wait to make it tomorrow! ny husband brought me a few sample chai tea k cups and I was afraid to try them. I made your recipe instead and omggggggggg I’m and now converted from coffee to chai tea every morning 🙂 takes longer to morning ale but it’s worth it… and the k cups still haven’t been used 🙂 do u think they’d be similar? This is a great recipe. For those restricting sugars and don’t care for sugar substitutes (that’s me) I left the maple syrup out. The natural milk sugars still made the latte enjoyably sweet. Awesome, Beverly! I’m glad you enjoyed the chai latte. AMAZING!!! I have made this three times and with coffee 2 times! delicious!! 🙂 I made it with coconut milk and a little coconut half and half. Better than with regular milk!! My mom loves it!! Awesome, Meaghan! I’m so glad you loved the latte. I bet coconut milk and half and half were a lovely addition. Just made this and it was everything I’d hoped it be. Such a comforting drink, and there’s something so satisfying wholesome about making it from scratch and knowing there’s no nasty additives in there. I have the added benefit of using my milk frother on my coffee machine too which makes this super luxurious. Thank you for the recipe, this is definitely my new treat! Yay, Danielle! I’m so glad the latte was everything you hoped it would be! I agree…”from scatch” always tastes sooo good! This looks delicious! What substitutions would I make if I used a chai black tea? Would I cut out the spices that you steep in the tea? Thanks in advance! Hey Beth, Yes, exactly :). Just use the chai tea bag versus the spices. Brew the tea and then froth the milk. Update: I tried subbing vanilla chai for the black tea and spices (except the additional cinnamon) and I also used coffee instead of water and sweetened it with liquid stevia. It is delicious! Thanks so much for this recipe! Yum, Beth! That sounds amazing! Hi! Do you use ground cardamom or pods? Thanks!! I cannot wait to try this. Hey Lacey, I use ground cardamom, but you could definitely use pods if you have them! hi, im going to make this recipe tomorrow, i am not sure what black tea bags i need to buy. As im not sure tea such as earl grey or rooibus will work? Hey Lauren, Yes, either of those options will work! Enjoy!! This looks great, I made your pumpkin spice latte this morning and loved it. Say I wanted to make this a dirty chai, but keep it at the same amount as I only have 16 oz mug, how would you suggest I adjut this and how mich coffee should I add? Hey CHolly, I’m so glad you enjoyed the PSL this morning! Hmmm, for the dirty chai, I would probably use 1/2 cup coffee (or two shots of espresso), and then add about the same amount of tea. Also, I would reduce the milk to compensate for the coffee addition. Of course, I haven’t tried these recommendations ;), but that’s what I’m thinking off the top of my head. Let me know how it goes! Hey Samantha, That’s so great! I’m so excited for you!! Awesome, Rachel! I’m so glad you enjoyed it! Oh my days this is delightful! Wasn’t expecting it to be that good at all! I used soy milk and it’s worked really well 🙂 Also I didn’t have maple syrup but substituted with some sugar and some vanilla extract in the milk. Thank you!! Hey Carys, I’m so glad you enjoyed the latte! Awesome, Dania! Glad the tip was helpful, and you enjoyed the latte. How can I substitute whole cloves with ground cloves? Hey Kym, I’m not sure how much you’ll need–maybe 1/4 teaspoon? Hey Joanna, I’m so glad you’re enjoying the latte! Cheers! That’s awesome, Georgia! I’m so glad you’re enjoying the tea. Hey i was wondering if it’s possible to sub out the cloves? Hey Gemma, They can’t be subbed for another spice, but you can try leaving them out. If you wanted to make this iced you can freeze milk with some spices mixed in so as it melts it gives more flavor instead if watering it down! I’m so glad you enjoyed it, Fiona! I don’t usually post reviews but I love chai tea (I am not a coffee drinker) so I am always looking for recipes to my tea favorites. This tea was awesome. The aroma alone was delightful. The tea has a perfect balance of flavors with just the right sweetness. I added less milk (I’ve used almond milk as well as coconut milk) because I love the strong tea flavor. The second best part is that I had all the ingredients in my cabinet. Thanks for sharing. Oh my gosh this is delicious. I used my Blendtec since I don’t have an immersion blender and it turned out super foamy. Thank you for the recipe! That’s so great to hear, Andrea! Great idea! That’s so great to hear, Erin. I’m so glad you enjoyed it! I bet you could use honey, too, if it’s a cheaper option. That sounds lovely! I bet that would be delicious in this latte!! Absolutely delicious and so simple. Thank you so much for this recipe! I am always on the search for the perfect Chai latte, but so far I haven’t found a coffee shop that does it just right. I made your recipe but instead of milk I used half and half, and I used 1/2 teaspoon black pepper instead of allspice. It was perfect! I added this to my coffee instead of tea. I have a milk frother, so no problem there. The spice blend is perfect. Thanks for the mix. Great idea, Jeffrey! I’m glad you enjoyed the spice mix. I am a tea lover, chai tea is my favorite and I have tried many recipes for chai tea latte(all miserable, undrinkable and expensive fails)…this is the first one that has passed my apparently next to impossible standards as excellent. This is THE recipe for me, thank-you! Yay, Rosalli! I’m so glad you’re enjoying the recipe! Great recipe thanks. Also where are the clip jars made with love from? Hey Charolette, Thank you! They are called Weck Jars. I purchase them off Amazon–they are available in a variety of sizes. I have bought chaI tea kcups and find them a little strong. I do add milk and sugar but the seems the strong taste stays. What can I do to make it better? Also, I am in love with the Dunkin Donuts version, so that may be my problem!! Hey Kristy, I’m not sure. I don’t have any experience with chai kcups. Have you tried this recipe? Hey Ghostcupcake, Hmmm, maybe 1/8 teaspoon? Just made this and it is so good. Will definitely make it again! Thanks for sharing. I’m so glad you liked it, Glenna! I cannot wait to try this recipe! If I want it to be a “Vanilla Chai Latte”, what would you recommend that I put in it and take out? I didn’t go through the whole process, but I used almond milk, tea and the spice blend and it was amazing! Better than expected! I’m going to make a a little container to bring to work for my afternoon tea. Unfortunately this turned out quite gooey for me. I had 2 attempts because I desperately wanted to learn how to make a chai from scratch. First round with maple syrup, second round with brown sugar instead. Both were so gooey! Really wanted to like this. Hey Eddie, I’m sorry it didn’t work for you. I’m not sure what was gooey about the tea–was it the spice blend? The actual tea was gooey? If it’s the spice blend, which can sink in the tea, you can try straining the tea through a cheesecloth. If it’s the tea, I’m not sure what to recommend–I don’t know what may have happened. While fruit is good and supper healthy for most too much is bad for me cause fruit has way more then8grams of natural sugar&8gramms of sugar is all im allowed in a serving of anything,a whole orange would be harmfull to me,but i eat a lot of vegatables,snack on nuts and eat brown rice when i eat rice,very very seldom eat pasta,eat the baer naked cereals,drink lots of water&diet juices&eat lots of salads&i eat 1 serving or less of all. For desert sweet tooth graving i eat some low sugar weight watchers choclate or Low sugar cookies or gogurt. I put gogurt in the freezer&that becomes my ice cream. I watch my family eat cakes,pies, ice cream,fruit,anything that looks good to them for dessert. So i know my body&stay healthy that way. Some of the stuff thats advertised as healthy when my daughter&i see it we go “yikes,thats healthy?” Which is most items in A health food store. I cant go to starbucks any more,but im glad a diabetic friendly version is included&cant wait to try this. Everyones body is different&thats ok,thats actually kind of great&amazing imo. Tried this recipe last night and it was delicious! Best Chai Latte I’ve had! I used a simple tea filter and it worked fine. Thank you, Manya! I’m so glad you enjoyed it! I’m so glad you loved it, Elle! 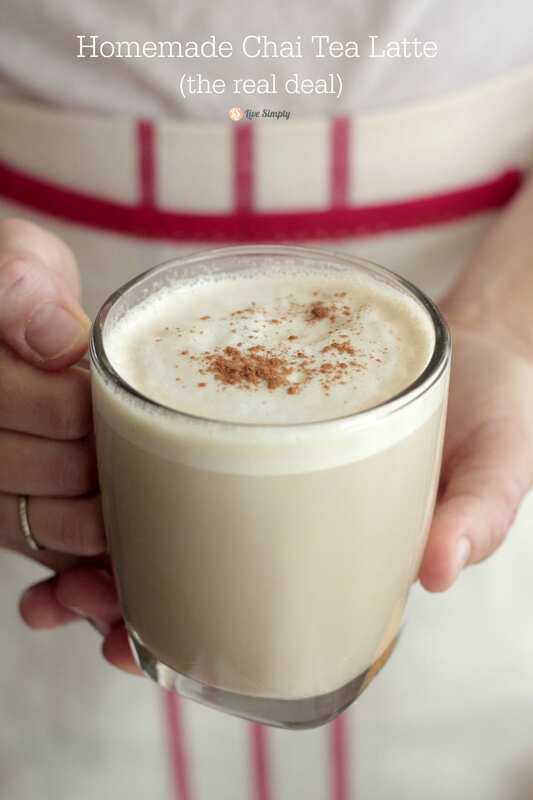 I just found this recipe and want to try it out since I love me some Chai tea lattes, but I have a couple of questions :). I watched the video and read the ingredients on the blog. You have two whole cloves listed on this page, but I didn’t see them added in the video. Is this an optional item? Secondly, on this page it says 1/2 tsp of allspice, but on the video it says 1/8 of a tsp. What amount do you recommend? Thanks! Hey Heather, Good questions! Stick with the recipe on this page–I’ll let my video guy know about the issues with the video. I LOOOOVE chai tea lattes and this really hit the sweet spot. Although I was missing maple syrup from my pantry, I was able to substitute it with brown sugar. Next time, I’m definitely going to try it with the syrup though. Can’t wait to try the pumpkin latte tomorrow. Running to the store tomorrow morning just for the syrup. Thanks, Tracy! I’m so glad it hit the spot! I just made the chai tea pumpkin latte and it was simple divine! 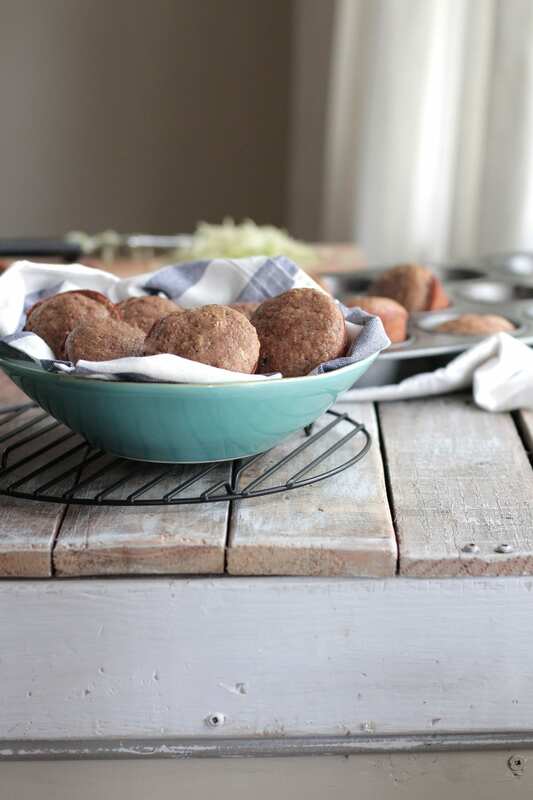 Thank you so much Kristin for sharing this yummy recipe! You are aware that this is an Indian beverage, right? This is not American cuisine. Talk about your cultural appropriation, yikes. Hey Lesley, This was an automatic setting assigned to ALL old recipes, not a cultural issue. We switched recipe plug-ins this past year, and instead of going through hundreds of recipes manually, we just decided to assign all as “American” as a temporary fix. It took months to even switch to an updated plug-in, and we’re working on fixing all the bugs and other issues currently. Please forgive us, and realize there’s usually more to the story and it’s best to find out that whole story before casting judgment and assuming. I have taken the time to fix this one so we don’t offend anyone in the future. A respectful comment about the label being incorrect is appreciated. Were you able to try the chai? If so, I hope you enjoyed it! I’m so glad you liked it, MJF. I love chai so much I created a company around it! I drink it daily, hot or cold depending on the season, but if I had to make each cup individually, it wouldn’t work with my schedule. So I make a pot full in my French press to last all week long. Just put it in the fridge and heat (or not) one cup at a time, add some milk and sweetener. I use stevia for a sugar-free, rich and spicy treat whenever I need one! Oh my god this is the most Devine smelling tea I have ever smelt. Tasted amazing. LOVED LOVED LOVED this will be a staple in my kitchen now. I found this recipe, and I’m super excited to try it! But would I be able to substitute honey for the syrup? Hey Abby, I think so. Awesome! I was also going to ask this, but totally forgot till now. If you have a store bought spiced chai tea bag, can you use that instead of making your own like in the above recipe? I steeped a chai tea bag in 1/2 cup of water and added a smidgen of your suggested spices to the milk, strained the milk as I poured it into the cup and it’s perfection! Thank you!! Make sure you are using fresh spices for the best result. Spices go stale in about 6 months. Stale spices may work but you won’t get the best flavor. I love homemade chai tea. Delicious! Thanks for sharing, Ayla. Enjoy! I have made this every fall for several years! We have honey bees so I have also used honey to sweeten it. It’s so good! hi! 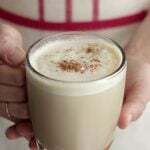 I just made your chai latte and it’s so delicious! The best chai latte Ive ever had is from a coffee shop in Park City and this is nearly a dead ringer! Im off to explore some of your other recipes and make something yummy 🙂 thank you! Hey Kathleen, I’m so glad you enjoyed it! Yum!! we will try this. In the written part you put 1/2 tsp allspice, and in the video you say 1/8 a teaspoon..
Hey Mischka, I would start with 1/8 and work up to 1/2 tsp depending on taste. Wow, This looks yummy. And I am so happy to know that I can make it at home. Can’t wait to try this. Thanks for the sharing this yummy recipe with all of us. I just bought all the ingredients and an immersion blender! Curious about one thing, do you use maple syrup instead of honey because of the flavor? Have you ever used honey instead? Hey Simone, I just perfect maple, but honey is fantastic. Enjoy!! Since my last comment, I followed your recipe almost exactly- but replaced the maple syrup with honey. It turned out PERFECT! So delicious. Thank you!